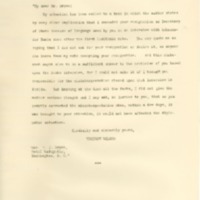 My attention has been called to a book in which the author states by very clear implication that I demanded your resignation as Secretary of State because of language used by you in an interview with Ambassador Dumba soon after the first Lusitania note. You may quote me as saying that I did not ask for your resignation or desire it, as anyone can learn from my note accepting your resignation. And this statement ought also to be a sufficient answer to the criticism of you based upon the Dumba interview, for I could not make it if I thought you responsible for the misinterpretation placed upon that interview in Berlin. But knowing at the time all the facts, I did not give the matter serious thought and I may add, in justice to you, that as you promptly corrected the misinterpretation when, within a few days, it was brought to your attention, it could not have affected the diplomatic situation. Wilson, Woodrow, 1856-1924, “Dumba Incident Misrepresentations,” 1917 December 17, WWP20633, Woodrow Wilson Press Statements, Woodrow Wilson Presidential Library & Museum, Staunton, Virginia.